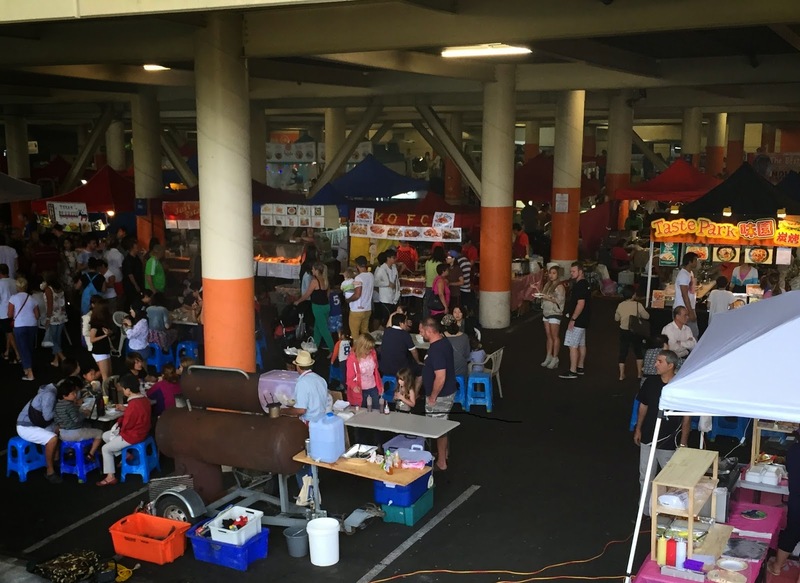 Around four years ago, we were excited to discover a night market in Pakuranga, selling all manner of delicious food under one roof. This became popular very quickly, so much so that the market not only grew in size, but the organisers ended up setting up more markets on different nights of the week, around Auckland to begin with, then spreading out to Hamilton and even Tauranga! * Hours as stated at the Auckland Night Market homepage on 12 February 2015. Stalls at the Glenfield market. Some of the stalls there were the same ones you find at other markets, but we manage to discover something interesting every time. The variety at the market is not only due to the different foods available (we have been ignoring the non-food stalls, I'm afraid), but also from the different stages a vendor is at—there were ones that didn't even have a name, just a table and a hand-written piece of cardboard; while other stalls had professionally printed signs, matching uniforms, and occasionally even a food grade rating prominently displayed. Here's a small selection of the items we came across last weekend. 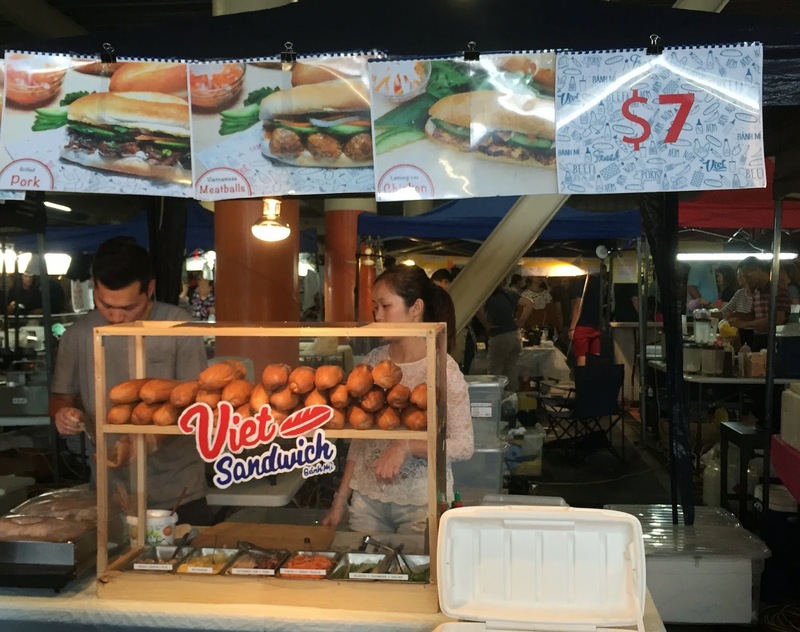 There's been a proliferation of businesses selling Vietnamese baguette sandwiches in Auckland, but this is the only one we know of that looks like a street-side cart, with the fillings on display. Bánh mì from Viet Sandwich. The secret to any fried food, from churros to Hungarian lángos (both of which were also available at the market), is that it should be fresh. The Chinese doughsticks (a.k.a. youtiao or yauzhagwai) found at Asian grocers are generally pre-made, so it was great to see this stallholder cooking them in a large wok of oil (she fished the sticks out just seconds before I took this photo). Freshly fried doughsticks, sesame balls and steamed siu mai. I've been wondering how long it will take for the hype around Chinese dumplings to fade away, but the comments on Twitter when Barilla Dumpling closed for refurbishment recently suggest that won't be any time soon. Similar dishes that don't get nearly as much attention include a couple of Shanghainese specialties: the steamed dumpling known as xiaolongbao, and the pan-fried bun called shengjianbao, both of which have a soupy centre when hot. These tasty creations were available at a couple of different stalls at the market. Before going to Turkey, our first food association with the country was in the form of kebabs. Our kebab shops here hardly do them justice, but thankfully we now have exposure to a different Turkish snack. Gözleme are filled pockets of pastry, cooked over a griddle. 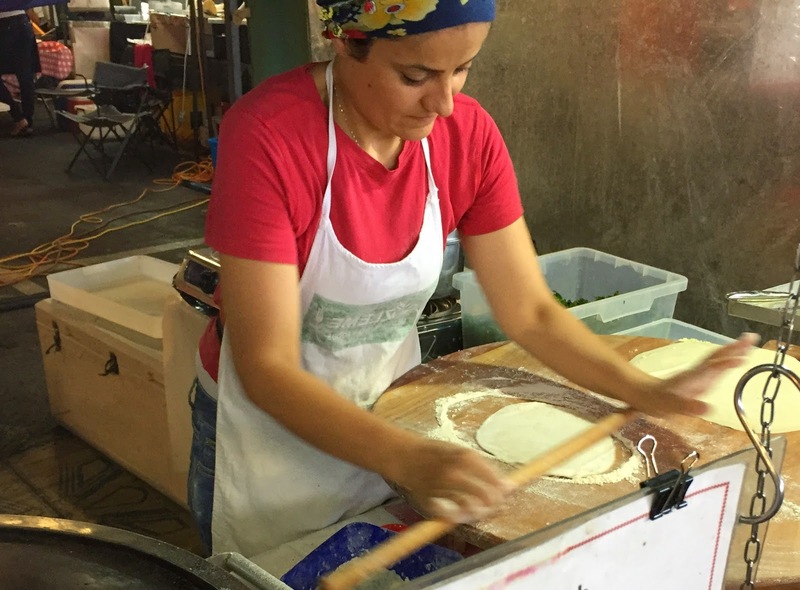 It was great being able to watch the dough being rolled out using a thin, wooden stick, spread with filling and sealed, then heated on a slightly curved dome. The end result looks amazing and tastes good too. It's not hard to find French crepes these days, but the market also had Brazilian crepes-on-a-stick and Japanese "Harajuku style" rolled crepes for sale, the latter complete with plastic models of the food. 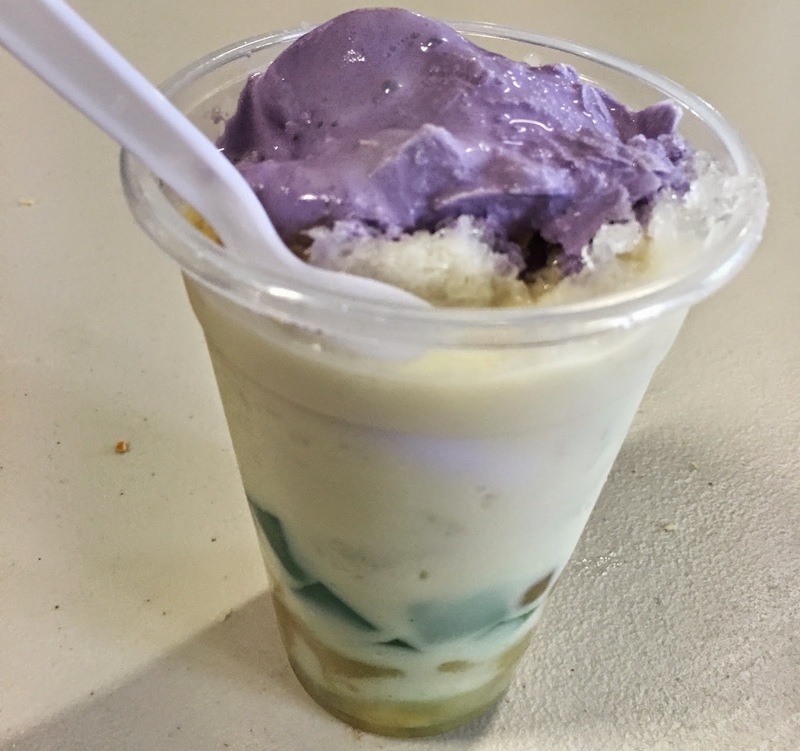 On the topic of dessert, we tried a Filipino creation with the delightful name of halo-halo for the first time. From the pictures on the web, we were worried that it would be as sweet as it was colourful. In fact, it was refreshing and flavourful. The ube ice cream mixed with shaved ice and condensed milk tasted like taro milk tea, and there was a multitude of treasures to be discovered at the bottom of the cup, including kumara chunks, fruit pieces, custard, jelly cubes, and tapioca balls. Size: the organisers of the Auckland Night Markets did a fantastic job of pulling stalls together, with apparently 120 stalls when the first one at Pakuranga opened. This means people can go back again and again and still keep trying new things. Location: I wish someone would set up something similar more centrally, so you could stroll over after work the way you can with the Silo Night Markets, or at least get there by public transport. I can understand that would be difficult though, as they have deliberately chosen mall carparks so that they are not dependent on good weather. Also, it is no doubt much cheaper to organise something where the rent is relatively cheap, and there is much less competition in the distant suburbs—a similar market in Mount Eden, Newmarket or Ponsonby would have to fight for customers who could just as easily go to the nearest restaurant or bar. Atmosphere: It feels like Asia with throngs of people, but the physical surroundings are not that nice, since everyone is crammed into a mall carpark. Timing: Some markets start small, only operating once a month to begin with. This makes it difficult to work out when to go, and some people will simply give up. Having a regular market, and different ones on multiple nights of the week, gives people much more flexibility, and they can just turn up on a whim. Seating: There needs to be more seating areas available so people can enjoy their food in comfort, and it can turn into more of a social activity. The same is true of Silo Park also, but at least there, there are more grassy areas which people are more likely to sit on than concrete floors. 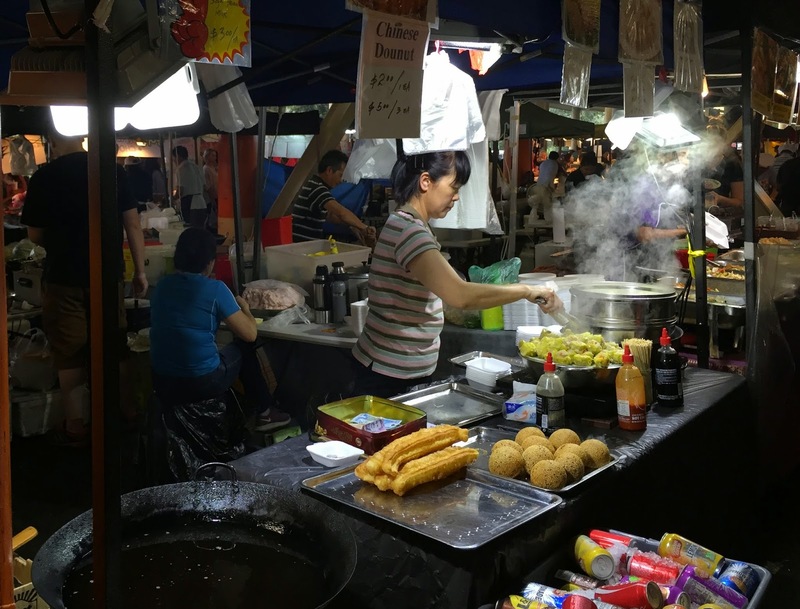 Food: The cooking quality differs from stall to stall, obviously. There seems to be a greater range of Chinese foods than from other cuisines, but I think the organisers have done a great job at having a bit of everything. I would like there to be more healthy options with sides of vegetables, for instance, but I guess that's not what most people are looking for when they go out to graze. Overall, the Auckland Night Markets provide an experience which is as close as it gets to street food culture in Auckland. There is plenty of food to choose from, and a vibrant atmosphere from the crowds. It would be even better if people didn't have to drive and were able to sit down more, but we highly recommend these markets anyway. Ahh this is one of my favourite places to visit on a Sunday night! One of the stalls does brilliant dan dan noodles too! Good to know - there are so many places to try, we have no idea how most of them are.